Fiber Flux: Free Crochet Pattern...Candy Shop Cowl! 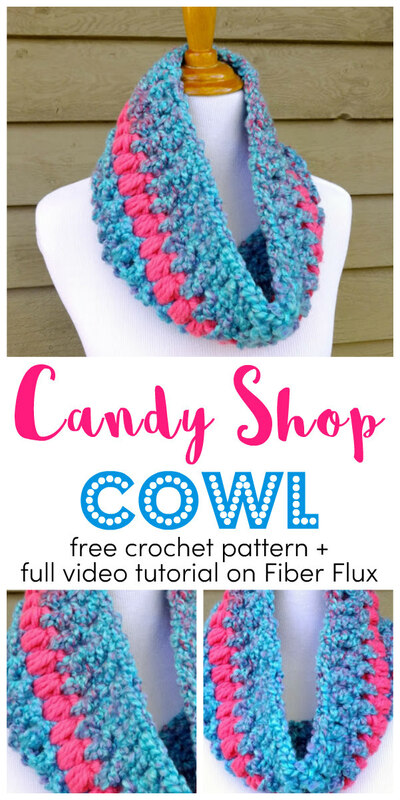 Free Crochet Pattern...Candy Shop Cowl! 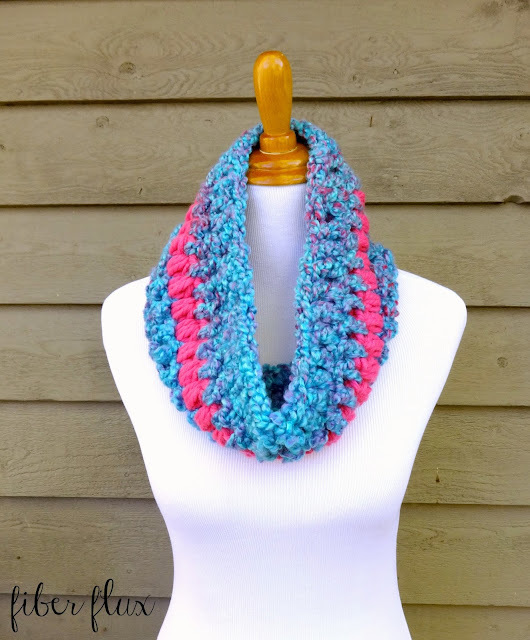 The Candy Shop Cowl is colorful, soft and super easy to stitch up. Worked in just five rounds, it is the perfect project for getting some quick gifts made up too! 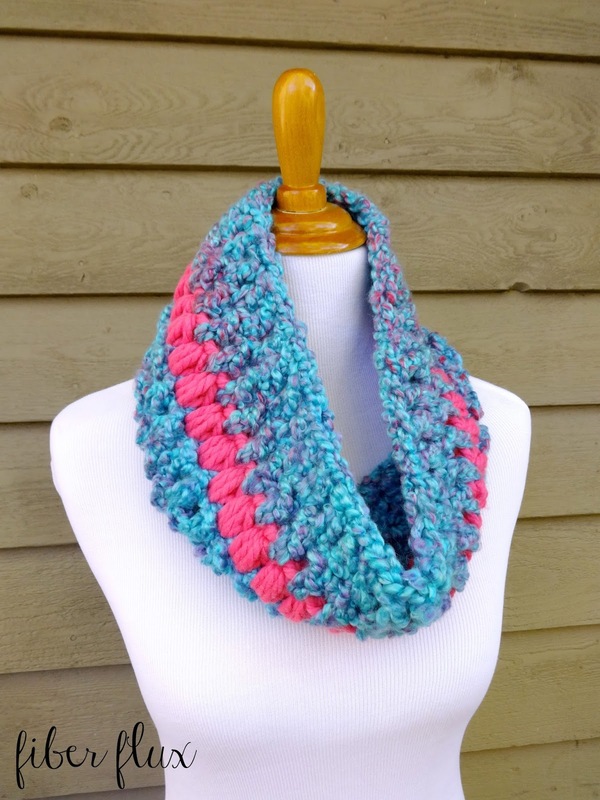 Thick and fuzzy blue yarn is reminiscent of cotton candy, while a round of bright pink puff stitches look like pretty little candies in a row. Note: To substitute yarn, any super bulky yarn will do. Note: Round 3 is the puff stitch round. To make a puff stitch, wrap yarn around hook and draw up a loop (3 loops on your hook), wrap yarn around hook and draw up another loop (5 loops on your hook), wrap yarn around hook and draw up a loop (7 loops on your hook). Wrap yarn around hook one more time and bring it through all 7 loops on your hook. Ch 36, join in the furthest ch from the hook with a sl st. Round 1 (blue yarn): Ch 3, then work a dc into each ch. Join to close round with a sl st. Round 2 (blue yarn): Ch 3, then work a dc into each st. Join to close round with a sl st. Round 3 (pink yarn): Ch 3, then work a (puff stitch, ch 1) in each stitch. (see notes above to learn how to work this stitch or follow along with the video) Join to close round with a sl st. Round 4 (blue yarn): Ch 3, then work a dc into each st. Join to close round with a sl st. Round 5 (blue yarn): Ch 3, then work a dc into each st. Join to close round with a sl st.
Fasten off and weave in and ends that remain. Learn more about this yarn with my Yarn 101 video series! Hi! I would like to fashion this as a scarf. What multiple should I use?